The Other End of the Candle: Let Freedom Ring! Didn't have much of a fourth today. We did our traditional indoor picnic (no bugs, no heat) with hot dogs, potato salad, baked beans, chips, bottles of pop and dessert - this year lemon pie and strawberry poke cake. After we headed up the hill past my folks place to view the fireworks. Somebody forgot to tell us the show got cancelled though! We waited in the car 45 minutes before – then stood outside for an hour waiting for it to start… after standing in fire ants we finally decided to call it and went down the hill to mom’s, picked up our poke cake leftovers, FORGOT to bring our little bag of fireworks and came home. 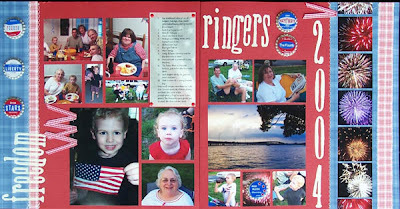 The page above is from our last fourth of July celebration in Florida - about 5 weeks before hurricane Charley. It's an old layout from long ago - but I like it - it's one of my favorites, simply because I was able to cram so many photos into it - 22 total! I love the LO. Sorry your fourth was so stinky!